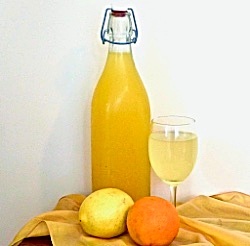 I first started making this refreshing drink many years ago when the children were young. At that time I used a kilo or more of white sugar in the recipe (before we were beekeepers!). Then I decided to experiment with honey. To start with I used half/half of sugar/honey, but now I have learned that using just honey works fine, and tastes delicious! Boil up the litre of water and allow to cool a little. 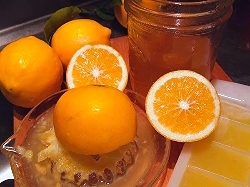 Squeeze citrus fruits of choice (use a majority of lemons). Place all ingredients into a large bowl, including scooped out pith and pips of citrus fruit, and about 1 tablesp. of finely grated rind. Stir well until honey is dissolved and leave syrup to sit in bowl for a few hours. Strain syrup through a sieve, then bottle. Store in fridge – it will remain fresh for a week or so. To serve, pour a small amount of syrup into a glass then top up with cold (or hot) water. A small amount of syrup added to a glass of water kefir(*) also makes a tasty, refreshing beverage.